21 червня 2014 року у Вільнюсі активісти з Німеччини, Литви та України поклали вінок та квіти під посольство РФ у Вільнюсі в пам’ять загиблих українців, загинувших під час російської агресії в Україні. 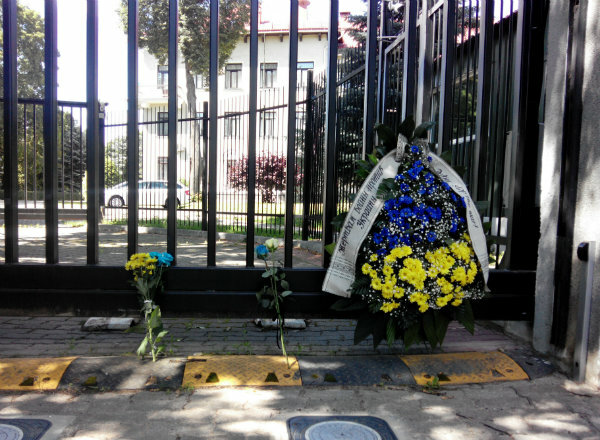 Охорона посольства у грубій формі почала вимагати забратися від посольства і невдовзі викликала поліцію. Литовські поліцейські дружелюбно поставилися до учасників акції і виконали формальність – переписали паспортні дані двох учасників акції. Акцію в Литві ініціював Тобіас Вейхманн, громадянин Німеччини, що проживає в Вільнюсі, створивши подію у Фейсбуці. Задля безпеки учасників, організатор не визначив точний час акції – учасникам пропонувалося приходити під посольства РФ в Литві у зручний для них час 21 червня 2014. Вільнюс приєднався до глобальної акції покладання вінків до посольств РФ, яка відбувалася у багатьох країнах світу. Anastasiya Dmytruk, a Ukrainian poet, wrote a poetry in which she emotionally explained why Ukrainians will never treat Russians as “brothers” after Crimea invasion. The notion of “Slavic brotherhood” has been of the strongest myths in among Russians who claimed the unity among Russia, Ukraine and Belarus. The original poetry was published in YouTube on March 19 and since then it received 1,712,000 views (as of May 20, 2014). Another version with a song performed by Lithuanian singers Virgis Pupšys,Jaronimas Milius,Kęstutis Nevulis,Gintautas Litinskas got 2,278 million views. Russian users were outraged since the poetry affected their nationalistic feelings. Dozens of replies were published in YouTube, but none of them did not get more views as original one. Yulia Marushevska, a student from Kyiv, who participated in anti-governmental protests in Ukraine, became famous in the West due to the one video, posted in YouTube. Marushevka appeals to the world, explaining why Ukrainians were fighting against government. The video came viral – it got 7,990,000 views as far as April 5, 2014. Now Yulia is on tour in Canada and the States. She was invited by TV channels, city councils, think tanks and universities to talk about Ukraine and the protests. 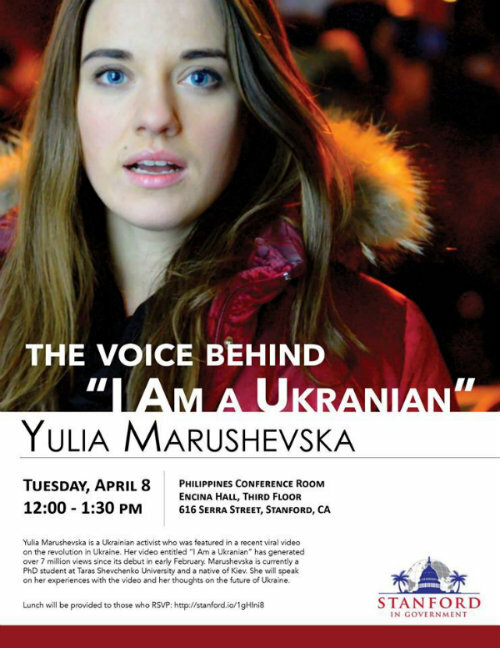 On April 8, Yulia gives a presentation at Stanford University. On April 13-15 she is visiting Boston. 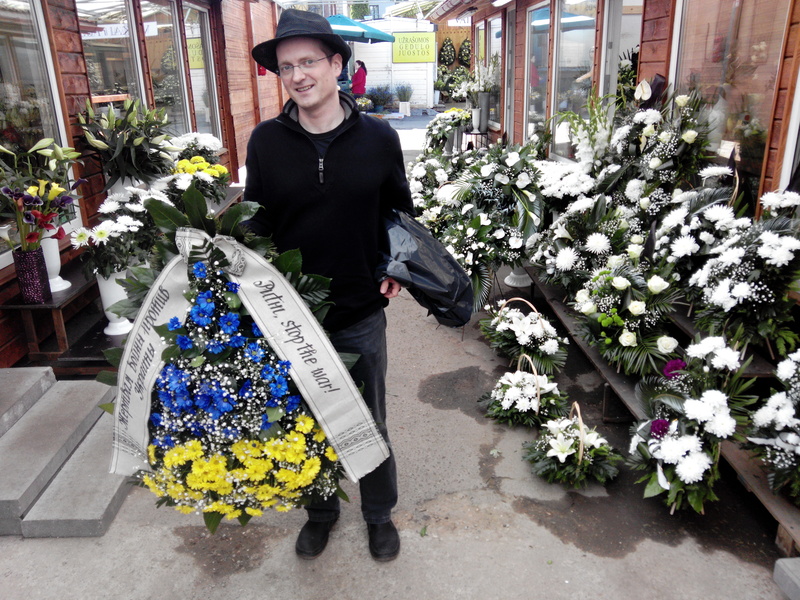 The effects of viral video “I am Ukrainian” appeals ideally to the Western audience since it demonstrates personalization of the protests in Ukraine. Yulia stands as an ideal hero – she is a protester, she is young and passionate, she speaks simply and sincerely and the language she talks is English. She is a direct victim of the drama, also her family members participated in protests. She symbolizes a new generation of Ukrainians – she is English-speaking, devoted to the civic values and is in the list of young professionals. At the same time, some authors mention the controversy of the video.. Yulia as a hero is too perfect to be real. Her message shows the developments in Ukraine in black and white, silencing the violence from protesters. Finding myself in the epicenter of the protests – often referred to here as a revolution – I decided to interview some of the people in the streets. There is one factual error: the heavy outpouring of people into the streets occurred over several days after the beatings, not immediately the next day.